Midcoast Youth Theater brings kids on stage. We find a place for every child who auditions regardless of experience. Each production is led by a team of producer, director, music director, choreographer, stage managers, and assistants. Theater helps children and teens develop social and emotional maturity, self-esteem, leadership and the ability to work cooperatively. Matilda is a little girl with astonishing wit, intelligence and psychokinetic powers. She's unloved by her cruel parents but impresses her schoolteacher, the highly lovable Miss Honey. Over the course of her first term at school, Matilda and Miss Honey have a profound effect on each other's lives, as Miss Honey begins not only to recognize but also appreciate Matilda's extraordinary personality. Matilda's school life isn't completely smooth sailing, however the school's mean headmistress, Miss Trunchbull, hates children and just loves thinking up new punishments for those who don't abide by her rules. But Matilda has courage and cleverness in equal amounts, and could be the school pupils' saving grace! Packed with high-energy dance numbers, catchy songs and an unforgettable star turn for a young actress, Matilda is a joyous girl power romp. Children and adults alike will be thrilled and delighted by the story of the special little girl with an extraordinary imagination. Inspired by the twisted genius of Roald Dahl, the Tony Award-winning Roald Dahl's Matilda The Musical is the captivating masterpiece from the Royal Shakespeare Company that revels in the anarchy of childhood, the power of imagination and the inspiring story of a girl who dreams of a better life. With book by Dennis Kelly and original songs by Tim Minchin, Matilda has won 47 international awards and continues to thrill sold-out audiences of all ages around the world. Matilda is in two acts, with a brief intermission, and runs about 2 hours 30 minutes. Tickets Tickets are available online or at the door for $15. Discounts are available for Seniors ($13), Students ($13) and Children under 5 ($5). Group discounts are also available for parties of 12 or more at $8 per ticket. Make sure you get tickets to this wonderful Maine premiere, before they are gone. Buy tickets online at https://mytmatilda.brownpaperticket.com. We accept cash, check or credit cards at the door and all sales are subject to seat availability. Online ticket sales cut off at midnight, the day before the show. Tickets however may still be available at the door. To exchange online tickets for another performance, call brownpapertickets.com at 1-800-838-3006 or email them at support@brownpapertickets.com. Please note, when purchasing tickets online, make sure you select the performance you will attend in the pull down menu on the form. If you mistakenly select a different show, we will make all effort to accommodate an exchange at the door, subject to seat availability. Location All performances at the Crooker Theater, Brunswick High School, 116 Maquoit Road, Brunswick, Maine. Please read through this detailed audition informational for all specifics around show dates and rehearsal information, troupe fees, auditions, cast requirements, character descriptions, and musical numbers/stories. The show will be performed on Thursday, May 2nd through Sunday, May 5th at Crooker Theater at Brunswick High School. Shows will be at 7:00 PM on Thursday, Friday, and Saturday and 2:00 PM on Saturday and Sunday. Rehearsals will be held at Mid-Coast Presbyterian Church at 84 Main Street in Topsham on Monday, Wednesday and Fridays 6:00-9:00 pm and Saturday 2:00-5:00pm. Not everyone will be called to every rehearsal. We try to keep the youngest performers to Friday and Saturday rehearsals, except during the last week before the show when the full cast will be called. Those cast as Primary Kids, which will be our youngest and/or less experienced cast members, will have the opportunity for learning about theatre through games from 1:00-1:45 PM each Saturday. Please contact the Director, Tammy Holmes, with any questions at tammy.holmes@midcoastyouththeater.org or send a private message to Tammy Dumont Holmes on Facebook. Troupe fees, paid by participants, help to offset some of the production cost. Troupe fees are $90 for the first performer and $80 for every additional performer in a family. Full or partial scholarships are available for those who need them. All information is kept confidential. Please bring a completed troupe fee form to the audition. AUDITIONS Auditions times are broken into separate slots depending on age, experience, and roles desired. Arrive ready to go at the start time of your slot. Everyone who auditions will be included in the show. The Director for this show, Tammy Holmes, and the Music Director, Courtney Babbidge, will help everyone who comes out to audition to feel comfortable to participate in the process. Please inform them of any special needs ahead of time. Please print out and bring or be prepared to fill out the audition sheet that will be posted. It requires that you list known conflicts. PRIMARY KIDS: This time slot is reserved for young cast members and those children who have no or limited experience. Suggested age range is 5-7. Children will be taught part of the song When I Grow Up and perform it as a group in front of parents. They will then practice taking stage directions through theater games. The PRIMARY KIDS will be featured in small groups in parts of larger song numbers and/or smaller skits. Please refer to the list of songs/stories at the bottom of this listing for specifics. ENSEMBLE ROLES: This time slot is reserved for those cast members who are mainly interested in being part of the ensemble, a small or large group of actors who perform on stage together. Please review the descriptions for the different ensembles in the character description list. If you are interested in an ensemble role without solo moments then the audition process will require a simple check of your vocal range, a group acting activity, and a group dance movement session. If you are interested in an ensemble role with musical solos then the audition process will still require a simple check of your vocal range. You will also be required to sing about 20-30 seconds from a song that is in the same style as the show, is memorized, and showcases your vocal ability. Please see contact information below for our Musical Director if you are not able to find specific sheet music. We will have all of the music from this show. If you are interested in an ensemble role with solo lines then the audition process will also require you to read and act lines from a character from Matilda. We will provide you this material at auditions. If you are interested in an ensemble role with both musical solos and solo lines of dialogue then you will be asked to do both. Everyone auditioning for an ensemble role will need to participate in a group dance movement session. *If you are a teen interested in both Big Kid and adult roles please plan to attend both sessions. This time slot is reserved for those cast members who are interested in an adult lead or supporting role as described in the character descriptions. Please note that the age ranges in the descriptions are a guideline. We recognize that someone may be able to play a role much younger or older than their actual age. Auditions for this group will include a song, dance, and acting portion. Unless your character does not sing any solos, come prepared to sing a song that you have memorized and that showcases your voice. You must sing with accompaniment from our Musical Director on piano and may not sing acapella. You may sing 32 bars or about 1 minute of a song of your choice. You may sing a song from the show, but keep in mind that sometimes the show's own songs are not the best audition songs. Please check with our Musical Director, Courtney Babbidge, if you are not able to supply sheet music for him to play. We will have all of the music from this show. He may already have what you are looking for, can easily access it, or will help make another suggestion. Courtney can be emailed at cbm7b5@yahoo.com. Please come ready to perform a dance number in small groups taught by our choreographer. Please stretch ahead of time and wear or bring sensible clothing and shoes for movement. Acting will be reviewed through cold readings in monologue form. You are encouraged to study those characters you are most interested. If time permits we will allow a second reading. This material will be provided to you at auditions. This time slot is reserved for those cast members who are interested in a child lead or supporting role as described in the character descriptions. Please note that the age ranges in the descriptions are a guideline. We recognize that someone may be able to play a role much younger or older than their actual age. Auditions for this group will include a song, dance, and acting portion. Unless your character does not sing any solos, come prepared to sing a song that you have memorized and that showcases your voice. You must sing with accompaniment from our Musical Director on piano and may not sing acapella. You may sing 32 bars or about 1 minute of a song of your choice. You can sing a song from the show, but keep in mind that sometimes the show's own songs are not the best audition songs. Please check with our Musical Director, Courtney Babbidge, if you are not able to supply sheet music for him to play. We will have all of the music from this show. He may already have what you are looking for, can easily access it, or will help make another suggestion. Courtney can be emailed at cbm7b5@yahoo.com. CALLBACKS IF CALLBACKS ARE NEEDED they will be held on Sunday, February 10th from 2:00-4:00PM. Anyone needed for the callback will be contacted Saturday evening. The callbacks will consist of singing songs from the show for the character you are being considered for, and acting from scenes from the show with other auditioners. A more complex dance audition may also be required. All information will be told to those contacted for a callback. Material will be sent by email to allow for study and memorization. IF NO CALLBACKS ARE NEEDED then a cast list will be posted on our private Facebook page by Thursday, February 14th. Our first rehearsal will take place on Saturday, February 16th from 2:00-5:00 PM to conduct a first introduction of the entire cast, handing out of scripts, and a reading and singing through the whole show. All cast playing students in the Student Ensemble will be divided into what is noted in the script as BIG KIDS and LITTLE KIDS. BIG KIDS will represent middle and high school students at Crunchem Hall, while LITTLE KIDS will represent elementary students. Our youngest and less experienced cast members will be referred to as the PRIMARY KIDS. There are ample opportunities for children of all ages to have stage time in this show. All roles in Matilda utilize a British dialect. Use of a British dialect at auditions is a plus but not required and will be taught during rehearsals. A Cockney accent (also known as an East End accent) is demonstrated by listening to Adele, Burt from Mary Poppins, Mrs. Lovett and Tobias Ragg from Sweeney Todd. A standard English accent (also known as Received Pronunciation (RP) is demonstrated by listening to Jeremy Irons, Helen Mirren, Colin Firth, or the Queen or Princess Diana of England. Good enunciation is required for all roles. Parent Meetings to include all teens and adult cast members will occur for 15 minutes on the first Saturday of the month to allow the Matilda Crew and/or MYT Board members to communicate to the cast. Facebook is our main way of communicating with the entire cast. Every cast member needs to have a way to access our private page where pictures and videos from rehearsal and important announcements will be posted. All information about our production will be easily accessed on this page. We strongly encourage everyone to be able to access this page so if you do not have a Facebook account we would ask you to create one just for use during this show. You could delete it afterward. Dancing will be required of all cast members with particularly strong dancing ability from Mrs. Wormwood and Rudolpho. All other characters will dance as well. While no experience is necessary because our choreographer will teach dance steps, we do expect a large cast which means less time will be available for extensive individual lessons. Effort, natural talent, and a willingness to learn and practice at home will all be considered. CHARACTER DESCRIPTIONS PLEASE refer to the descriptions below for specific role requirements. Matilda is an imaginative girl who is clever and wise far beyond her years. She is mysterious, serious, and intense. She lives in a verbally abusive home where she escapes to her books and into her imagination. She is able to speak assertively and has a strong moral compass, analytical mind, and a thirst for learning that cannot be quenched. Matilda is willing to break the rules for the greater good. This actress needs to have instinctive acting ability. She needs to be a strong singer who is able to tell a convincing story. A Cockney accent is required. Trunchbull is the tyrannical headmistress at Matilda's school. She adheres to her interpretation of rules and despises children. She is described as a gigantic, holy terror, preferably 6’ plus, who is physically imposing and must be physically fit and agile to dance, exercise, and perform acrobatics. She uses her former discipline as a famous Olympic hammer-throwing champion to terrorize her students. She “marches like a storm trooper with long arms swinging” with an “aura of menace”. It is through Trunchbull's over the top and radical ways that the right actor/actress will have the audience in stiches. This actor must be a high baritone with a strong F#/G. This is not a drag role and the person needs to be able to convincingly play a formidable woman. This actor also needs to have extremely good enunciation and vocal dexterity. An RP accent is required. Miss Honey is Matilda's kind-hearted teacher. She is a mild, quiet person who never raises her voice and seldom seems to fully smile, yet she possesses the rare gift of being adored by every child under her care. She is tired of living in fear under Miss Trunchbull. She is so slim and fragile that she is described that if she fell over she would smash into a 1000 pieces. An RP accent is required. Mr. Wormwood is Matilda's uncaring father who only wants sons and doesn’t believe in books but rather from learning all he knows from the television. He is a slimy, greedy used-car salesman who tries to manipulate some Russians into buying low mileage cars which he has rolled back the odometer. He is crooked, scheming, dense, and can be mean. This actor should have ease of movement and skills in clowning. He wears jackets with large, brightly colored checks stereotypical of a sleazy used-car salesman. This actor has to be a strong character actor who could have a weasel or ratty essence. He interrupts intermission to talk to the audience. A Cockney accent is required. Mrs. Wormwood is Matilda's self-absorbed, negligent mother and an amateur ballroom and salsa dancer. She is shallow, vain, and extraordinarily loud of voice, dress, and makeup. She is a strong dancer who is obsessed with her amateur ballroom dancing partner, Rudolpho, and in winning the prized Golden Shoe award. She has no interest in having a baby let alone a daughter. She must belt to a high F/G in the number Loud, which is a difficult song and requires a very strong tone and the ability to dance at the same time. This actress must have strong comedic timing. A Cockney accent is required. The only supporting children roles in this show will be called the Main Kids as a group. Main Kids are Matilda’s classmates and friends from Crunchem Hall. They are Lavender, Bruce, Nigel, Amanda, Eric, Hortensia, Tommy, and Alice. Each of them has music solos, duets, and dialogue. Main Kids will appear in every song with children. Lavender is Matilda's classmate and best friend who is loud and kooky. She likes to have fun and has a big personality. She is the smallest of her classmates but gutsy, adventurous, and in awe of Matilda. She is brave and pulls off a harmless prank on Trunchbull. She dresses as the ballerina in the opening scene. Bruce attends Crunchem Hall. He is subject to extreme punishment by Miss Trunchbull after she discovers he has eaten a piece of her chocolate cake. He belts up to an F# and is slightly older than Matilda. This actor needs to have comedic timing and must eat chocolate on stage so can’t be allergic. He dresses in army gear in the opening scene. Nigel is Matilda’s classmate. He is a bright boy who is confident and full of energy. He may be nerdy. Trunchbull picks on him because he has filthy hands and shirt, but he doesn’t give in to her bullying and continues to be a loud and cheerful voice in the classroom while she torments them. He dresses as Spiderman in the opening scene. Amanda is a student at Crunchem Hall. She is tormented by Trunchbull. She has a slight frame and is spun around by Trunchbull by her braids. She dresses as Superwoman in the opening scene. Eric is Matilda’s classmate. He is tiny, cute, and picked on by Trunchbull. She lifts him up by his ear, stretching it, when he cannot correctly spell “what.” He must sing, dance, and act well. He dresses as Batman in the opening scene. Hortensia is a student at Crunchem Hall. She is a feisty, older girl, twice their age, already 10, and a veteran of battles with the Trunchbull. She is a rugged girl with a swagger. She fills Matilda and Lavender in on everything they need to know about Miss Trunchbull. Hortensia is the strongest dancer of the girls. She dresses as the Queen in the opening scene. Tommy is one of Matilda’s classmates. He is one of the strongest boy dancers. He dresses as the Incredible Hulk in the opening scene. Alice is a student at Crunchem Hall. She dresses as Wonder Woman in the opening scene. Mrs. Phelps is a warm and nurturing local librarian who encourages Matilda’s love of reading. She has an inner peace. An accent different from others in the show is required. Rudolpho is Mrs. Wormwood’s dance partner. He shares her passion for competition and dance. This actor should be genuinely fit, athletic, and have a flair for character and comedy with great vocal and dance stamina for the number ‘Loud’. Latin ballroom experience is a plus. Any United Kingdom accent can be used. The Escapologist, a circus performer who escapes from anything locked, is a character from Matilda’s story that comes to life on stage while his story is being told. He is deeply in love with his wife, the Acrobat, and together they desperately want to have a child. He is charismatic, confident, warm and caring. An RP accent is required. The Acrobat, a circus performer who flies through the air as a trapeze artist, is a character from Matilda’s story that comes to life on stage while her story is being told. She is graceful and elegant wearing an elaborate costume much like a Las Vegas showgirl. An RP accent is required. Sergei is a Russian Mafia Boss who is physically intimidating with an accomplished Russian accent. He learns that Matilda is the smartest one in her family. The Doctor appears in the opening scene and has dialogue and solos. He explains to an astonished Mrs. Wormwood that she is 9-months pregnant. He is shocked to learn how much she does not appreciate bringing a baby into the world since he values human life. An RP accent is required. The Children’s Entertainer for a birthday party appears in the opening scene and sings a 16-bar solo during the opening number. Michael is Matilda's older brother who is not very bright but is favored by their parents. He is a boy of few words and even fewer thoughts. He spends nearly all of his time watching television. This actor needs good deadpan comedy and the ability to find a character during a lot of stage time with few words. A Cockney accent is required. The Henchmen are all part of the Russian mafia. They enter the final scene in the show, provide comedic relief, and each has a short line or two. *Henchman 4 will be played by a younger cast member, male or female. Student Ensemble play elementary, middle, and high school age students that look 5-18 years old to appear in various student scenes and songs. All cast playing students in the Student Ensemble will be divided into what is noted in the script as BIG KIDS and LITTLE KIDS. BIG KIDS will represent middle and high school students at Crunchem Hall, while LITTLE KIDS will represent elementary students. Our youngest and less experienced cast members will be referred to as the PRIMARY KIDS. There are musical solos and dialogue opportunities for BIG and LITTLE KIDS. Parent Ensemble will play parents of children in the opening scene. Eight are listed as Mum 1, 2, 3, 4 and Dad 1, 2, 3, 4 and have specific musical solo lines. They play parents who think their child is extra special. Extra parents may be added. These are non-speaking roles that provide comedic effect as children are playing adult roles as mechanics at Wormwood Motors. They will also be smoking fake cigars. Cook is a non-speaking character. She may groan, moan, and ad lib her way on audience left to enter with a full 18” chocolate cake to replace the piece of cake that Bruce ate. She is covered in chocolate herself and appears a bit crazy. Scary Kid represents the Big Kids who some kids meet on their first day of school. Scary Kid is scary in his posturing and intensity in trying to warn the little kids about Trunchbull. He has several lines. Nurses and Doctors are non-speaking roles that add to the opening scene with The Doctor who treats Mrs. Wormwood. Nurses will go back behind the curtain to help Mrs. Wormwood give “birth”. Young doctors will stand and confer and appear as backup singers/dancers for the Doctor. Nurses will join in too. Loud Dancers are non-speaking pairs of dancers, 4 couples or more, who will wear loud and tacky dancing outfits coordinated with Mrs. Wormwood and Rudolpho’s for the song Loud. Judges come in during the Loud song and make judgmental faces and hold up score cards. While Oxydent sponsored Bert Healy and the Oxydent Hour of Smiles, our production of Annie could not have happened without the generous support of our own show and season sponsors. Midcoast Youth Theater would like to thank our show sponsors, Midcoast Humane, Water's Edge, and Coastal Maine Pediatric Dentistry. We would also like to thank our season sponsors, Bath Savings Institution, WEX, Inc., George P. Davenport Trust, and the Priority Real Estate Group. Thank you for your generous support of the arts and for the young people of our community. You'll find information about the show, including show dates and ticketing information right here. So, from all the Hour of Smiles family... err I mean Midcoast Youth Theater family, thank you and see you at the show, ya hear! Join us for Auditions for this all-ages musical! 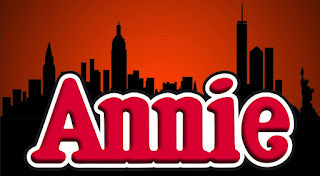 Story Summary: Annie is a determined 11-year-old set out to find her parents who abandoned her years ago on the doorstep of the New York City Orphanage that is run by the cruel, embittered Miss Hannigan. With equal measures of pluck and positivity, little orphan Annie charms everyone’s hearts despite a next-to-nothing start in 1930s New York City. She finds a new home and family in billionaire, Oliver Warbucks, his personal secretary, Grace Farrell, and a lovable mutt named Sandy. Miss Hannigan’s brother, Rooster, fresh out of jail and his girlfriend Lily St. Regis plot to pretend to be Annie’s parents to swindle Oliver Warbucks out of the reward money to find Annie’s real parents. Together with the help and cheer from the other girls at the orphanage and the help from her new friend President Franklin Delano Roosevelt, Annie remains forever hopeful in what lies in store TOMORROW! 1. Find the time slot below that best fits your age, experience, and roles. 2. Print and complete the Annie Audition sheet. This is used by the production team for casting, on going communication throughout rehearsals and the production. 3. Print and complete the MYT Registration Form. This is used by the Treasurer for billing and scholarships. Troupe fees for this production are due by October 27th and can be paid at any rehearsal, at the audition or by mail. 4. Remember to bring the completed audition sheet and registration form with you to your auditions. All minors must have their guardian's signature on their audition sheet. Auditions times are broken into separate slots depending on age, experience, and roles desired. Arrive ready to go at the start time of your slot. Everyone who auditions will be included in the show. The Director for this show, Tammy Holmes, and the Music Director, Courtney Babbidge, will help everyone who comes out to audition to feel comfortable to participate in the process. *If you are a teen interested in both orphan and adult roles please plan to attend both sessions. ENSEMBLE: This time slot is reserved for those cast members who are mainly interested in being part of the ensemble, a small or large group of actors who perform on stage together. Please review the descriptions for the different ensembles and choruses below. The audition process will be simplified to allow individuals to learn part of a song from the show and sing in small groups. Acting, movement, dance, and taking stage direction may be added to the song. This time slot is reserved for those cast members who are interested in a lead or supporting roles as described in the character descriptions below. Please note that the age ranges in the description are a guideline. We recognize that someone may be able to play a role much younger or older than their actual age. Auditions for this group will include a dance, song, and acting portion. Please come ready to perform a dance number in small groups taught by our choreographer. Come prepared to sing a song solo that showcases your voice. Usually, 16 bars or about 1 minute of the song suffices. You may sing a song from the show, but keep in mind that sometimes the show's own songs are not the best audition songs. Our musical director, Courtney Babbidge, will accompany auditions. Please check with Courtney if you are not able to supply sheet music for him to play. He may already have it, can easily access it, or will help make another suggestion. Courtney can be emailed at cbm7b5@yahoo.com or contacted via Facebook at https://www.facebook.com/courtney.babbidge. Show Dates and Rehearsals: The show will be performed on Thursday, December 13th through Sunday, December 16th at Crooker Theater in Brunswick. Rehearsals will be held at Mid-Coast Presbyterian Church on Monday, Wednesday and Fridays 6:00-9:00 pm and Saturday 2:00-5:00pm. Not everyone will be called to every rehearsal. We try to keep the youngest performers to Friday and Saturday rehearsals, except during the last week before the show when the full cast will be called. Annie is a complex, tough, streetwise kid who is surprisingly vulnerable when she thinks she might lose what has become most important to her: her new found “family.” This actress will need to be able to be adaptable to play motherly, independent, overwhelmed and hopeful. She should be strong vocally and musically and must be able to light up the stage when singing “Tomorrow!” The actress may be asked to color hair and/or wear a wig. Oliver is a powerful billionaire, who always has his mind on business, but has a kind heart looking for someone to love. This is a challenging role. In the beginning, the actor is awkwardly affectionate with Annie and later finds himself completely charmed by her. This actor will need to play very focused and gently authoritative. Preference will be given to actors who are bald or balding and/or willing to shave their head. Warbucks sings solos “Why Should I Change a Thing” and “Something Was Missing” and solos within “NYC” and “I Don’t Need Anything But You”. Grace is the classy, confident, likable, and intelligent private secretary to Oliver Warbucks. She brings Annie and Warbucks together while businesslike in handling him and maternal in dealing with the girl. She sings solos and duets in “I Think I’m Gonna Like It Here”, “NYC”, “You Won’t be an Orphan For Long”, and“I Don’t Need Anything But You”. Aggie Hannigan is desperate and unhappy with her lot in life. She yearns for a better life and wants to love and be loved. This actress must have strong comic timing and have a versatile singing voice to be able to create a larger than life character. She sings Little Girls solo. The Orphans, Female, suggested age range for auditioning is 7-17 to play various ages listed after each one. All of the orphans sing solo lines in It’s a Hard Knock Life and will need a range of a low A to a high F. They also sing the reprise of the song Fully Dressed. They must be versatile actresses who can display all of the ranges of emotion for their character. One minute they might be mad or sad and the next happy, hopeful, or scared. They are gritty girls who are neglected and vulnerable, yet basically honest and lovable. Each actress should be able to shape her own specific character. Their character age is listed below but we are open to interpretation. A suggested age range is listed for auditioners. This is a guideline and others outside of this age range are free to audition. MOLLY: The suggested age range for auditioning is 7-11. Molly is supposed to be age 6. She is one of the youngest orphans but is showcased during It’s a Hard Knock Life when she pretends to be Miss Hannigan. She is Annie’s best friend and also sings a small solo in “New Deal for Christmas”. KATE: The suggested age range for auditioning is 8-12. Kate is supposed to be 7. She is the second youngest orphan. PEPPER: The suggested age range for auditioning is 10-15. Pepper is supposed to be age 12. She is the toughest of the group and is quick to pick a fight. JULY: The suggested age range for auditioning is 11-16. July is supposed to be age 13. July is the quietest of the group but sings a solo in “Fully Dressed”. DUFFY: The suggested age range for auditioning is 11-16. Duffy is supposed to be 13. Duffy is one of the oldest orphans. Rooster Hannigan is Miss Hannigan’s greedy and dishonest brother who has just gotten out of another stint in jail. This is a great character role for an actor who can play a limber, slimy con artist. He is self-assured to the point of being cocky and dresses flashy. This actor plays off of his stage girlfriend Lily St. Regis. This actor plays off of his stage girlfriend Lily St. Regis. Rooster sings solos in Easy Street. Lily is the shady and floozy girlfriend of Rooster. This actress must be able to pull off a convincing thick New York accent and play as an airhead. This actress plays off of her stage boyfriend and must have solid comedic timing. Lily has solos in “Easy Street”. The President of the United States takes an immediate liking to Annie and her optimism. This actor must be able to imitate this president. The President sings solos in “Cabinet Tomorrow” and “New Deal for Christmas”. She is an aspiring Broadway actress who sings a key solo during “NYC”. She needs a BIG BELT to give that solo the energy and hopefulness it conveys. Bert is a popular and charming radio announcer with a classic voice and style reminiscent of the 1930’s. He sings “You’re Never Fully Dressed Without a Smile”. NYPD officer who is suspicious of Annie. Bundles is the laundry man who flirts with Ms. Hannigan and aids Annie’s attempt to escape. Fred is the puppet wrangler. He uses a dummy on Bert Healey’s radio show. Bonnie, Ronnie, and Connie are a singing group that sings back up to Bert Healy. These actresses must be able to sing well and harmonize. They will need to also need to have physical traits to be convincible as sisters. Ickes (Pronounced ICK-EEZ) He is a pessimistic and worried politician who serves on the Cabinet for President Roosevelt. He is instructed to start singing Tomorrow by President Roosevelt and sings the beginning solo. He will sound terrible on purpose! She is a firm but concerned female politician who serves on the Cabinet for President Roosevelt. Hull is a worried politician who serves on the Cabinet for President Roosevelt and must be able to sing harmony. He is a worried, but hesitant politician who serves on the Cabinet for President Roosevelt. He is a kind friend and manager who also serves on the Cabinet for President Roosevelt. He has the added responsibility to travel the President around in his wheelchair. He must be able to sing harmony. Judge who Warbucks hires to hold the adoption of Annie. This is a LARGE ensemble show! There are four ensemble/choruses. The ensembles in this show play a CRUCIAL role. There are multiple numbers that all ensemble will be in. The orphan ensemble will be broken down into further groups to ensure that everyone gets proper stage time, to separate into focused groups who dance or sing, and for placement on stage. These girls are gritty, neglected, yet basically honest and potentially lovable. They have mischievous fun with each other and also have “sibling-style” fights. Appleseller and Sophie along with several others referred to in the script as Man 1-4 and Woman 1-4 are the central characters that represent the poor of NYC. These are all homeless and jobless people who live in shanty towns. Appleseller and Sophie are children who lead the town and members in it. Sophie is an outspoken child (similar to Annie). These characters are the central figures in Act 1, Scene 3 with many lines and a few solo lines in their song and dance number “We’d Like to Thank You”. He is an English butler who serves Oliver Warbucks and while he takes his job to keep order seriously he is amused and taken by Annie. The right actor with strong comedic timing will steel some scenes. These women are French maids who are loyal servants. They are supervised by Drake and Grace. She is the head housekeeper. She is the head cook. Up to a dozen more servants will be chosen from the cast. All must sing and move well. Specialty dancers will be cast into this group for their big song and dance numbers “I Think I’m Gonna It Here”, “You Won’t Be an Orphan For Long”, “I Don’t Need Anything But You” and “A New Deal for Christmas”. This chorus consists of a scene that takes place in downtown New York City to sing the longest song in the show “NYC”. Characters will include a representative of the Salvation Army with a Santa Clause, a nanny nurse with baby buggy, children playing pickpockets, people handing out flyers, firemen with a ladder, theatre goers, tourists, street vendors, and usherettes at the Roxy Theatre, as well as, an appearance by our favorite swindlers Rooster and Lily. MYT is a non-profit organization providing equal opportunities for all children to perform in full length musicals, without regard for past experience or financial resources. We produce 2 multi-age shows (in the Spring and Fall) and 4 youth-only shows in the summer divided by age groups.Each production is led by a team of director, music director, choreographer, producer, stage managers and assistants. Midcoast Youth Theater brings kids on stage. Our program helps develop collaborative, cognitive, artistic and social skills in our youth participants, and brings great entertainment to Midcoast Maine.